Portland Basin Museum is the centrepiece of the rebuilt Ashton Canal Warehouse, now looking much as it did in 1834 when it was first built. Here you can walk back in time to learn about Tameside's history, and experience for yourself the lifestyle, industries, crafts and trades of previous generations. In its peaceful waterside setting, Portland Basin provides the perfect day out. Take a walk down our 1920's Tameside street, and discover just how times have changed! Call at the Bridge Inn, meet the neighbours, and skip in the school playground. Chat in the chippie, pop into the grocer's, visit the doctor, and hock the family silver! Explore the recently refurbished industrial history gallery and learn about the local cotton industry, hatting and gloving, coal mining and farming. Discover the history of Tameside's crafts, including blacksmithing, clogging and printing. There are new displays about donkey stoning and local companies like Jones Sewing Machines and Robertsons jam. Plus there's a new interactive canal boat to explore. Our hands-on approach enables visitors and school groups to learn about Tameside's history through interactive displays and exhibits. (Special events and holiday drop-ins - please ring for details). A large range of entertaining and informative publications, postcards, toys and souvenirs are on sale in the shop. 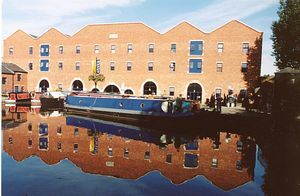 Portland Basin Museum is situated close to Ashton town centre and all major public transport links. The Museum is about a mile from J23 M60.